An operation east of the Euphrates is only a matter of time, President Recep Tayyip Erdoğan hinted Wednesday, underlining that the terrorists of the PKK's Syrian affiliate, the People's Protection Units (YPG), will get what they deserve via the offensive. "We showed those who wanted to bring us to heel using the terror corridor that it is not possible. 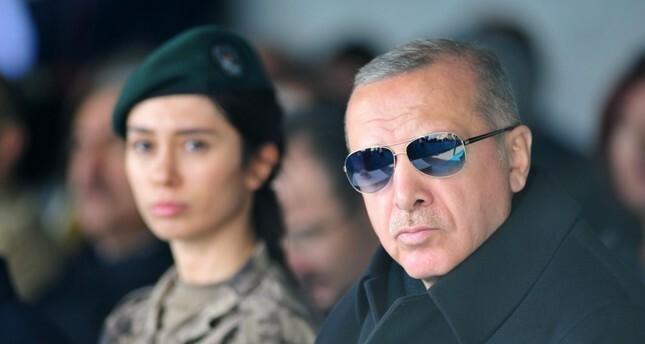 We will give new messages to those who still insist on the same scenario in a short time," Erdoğan said, speaking at the opening ceremony of the new building of the Gölbaşı Special Operations Headquarters, which was bombed during the July 15, 2016 coup attempt that killed 251 people. Erdoğan also expressed Turkey's determination about its war on terror, saying: "Those who want to set our nation against each other did everything they can. Even though they plotted a coup attempt, they could not get the result." Ankara reiterates that it will not allow PKK-affiliated groups to establish a terrorist corridor on its southern border that could threaten Turkey's border security and peace. Turkey carried out two cross-border operations west of the Euphrates River, Operation Euphrates Shield launched in August 2016 and Operation Olive Branch in January 2018, to drive terrorist groups, including the YPG and Daesh, from its borders. While the country liberated northwestern territories from Daesh, it also prevented the YPG from establishing a de facto autonomous region in Syria connecting the northwestern Afrin canton to the Kobani and Jazeera cantons in the northeast, which Ankara describes as a "terror corridor" posing a grave security threat to its national security. This time, Turkey aims to drain the terror swamp near its border, protect Syria's territorial integrity and ensure political stability with a possible operation east of the Euphrates River to eliminate YPG terrorism. Turkey had long signaled a possible operation in areas held by the YPG east of the Euphrates. However, the government decided to postpone the operation for a while after U.S. President Donald Trump decided that Washington, the main backer of the terrorist group, would withdraw its troops from Syria. While Washington continues preparing for withdrawal despite dissident voices, it has been holding talks with Ankara and discussing a plan to form a safe zone. Turkey has stressed that the zone must be free of terrorists to ensure its border security and enable the return of Syrian refugees. The close U.S. partnership with the YPG since the former Obama administration has always been a sticking point in Washington-Ankara relations. Turkey sees the YPG as an extension of the PKK, a group that has claimed the lives of more than 40,000 people in its 30-year terror campaign against Turkey. The U.S., however, while listing the PKK as a terrorist group, opted to continue its steadfast militarily support for the terrorist organization under the pretext of fighting Daesh, despite warnings that the YPG does not represent Syrian Kurds.